Psoas and quad stretch with the wall. The pose that saved me from pain! In 2008, my right knee's patella had tracked all the way to the side of my leg. It was a nasty business - constant pain inhibited walking. Swelling in the joint caused blood vessels to burst that I have proof of still. It was this hearty shove from the universe that introduced me to yoga. A customized yoga routine did for me what physio, massage therapy, chiropractics, and therapeutic ultrasound had failed to do: got me out of pain, and into mobility. These variations are key to my practice, particularly during times of high impact activity like running or jumping rope. 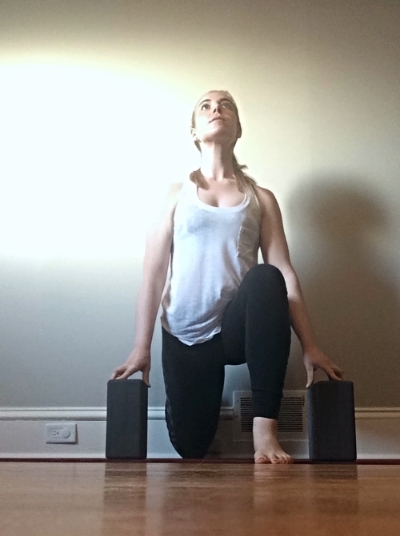 Place your yoga mat against the wall with two blocks handy . Place your hands to the ground in front of the right leg, and bring your left leg forward into a lunge shape. Move your left hand to the outside of your left leg and set up your blocks under your hands. Lift upright so you're standing on the lunging leg and the opposite knee. With body weight gently supported by the blocks, press down through the knee cap as your hips track forward. Breathe deeply into the magical sensation. Toward the end of your practice, so this region has blood flow and warmth. For teachers, works nicely to end class with and follow up with pigeon with the wall or legs up the wall. 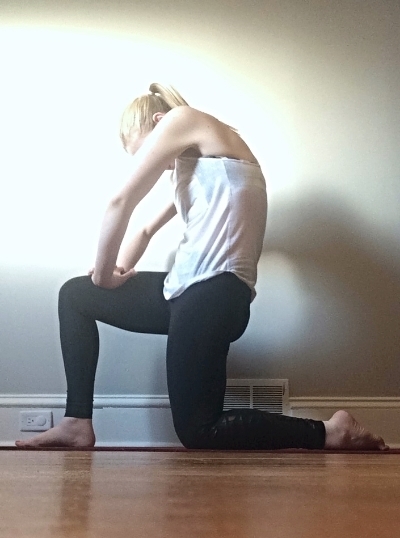 Wall brings knee into flexion for the yogi, where this is only available to yogis who are strong and stable enough to come into a lunge and draw the back knee into flexion on their own. Do you need something deeper, because your hip extension and knee flexion work in sweet harmony together? You can remove the blocks and place your interlaced fingers on your quad. Move your hips back toward the wall to bring as much of your back body onto the wall. Continue to press down through the knee and lift your hips away, lifting the front edges of your pelvis upward and your ribs away from your waistline. Remember to breathe into the magic! Still not enough for you, or want something different? This was my happiest discovery on the wall a few months ago. You can deepen into your vastus lateralis (the largest muscle that forms the quadriceps, and the real guilty party in what many people perceive to be "tight IT bands"), by bringing a side stretch into the pose. 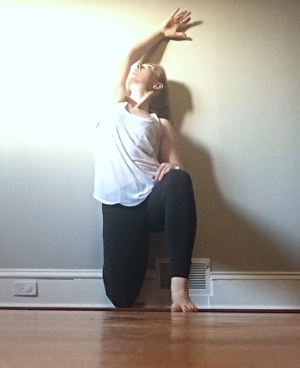 From any previous variation, lift the arm of the leg against the wall, and introduce a gentle side stretch - continuing to extend through the torso and press down gently through the knee. A great quad and hip flexor stretch without the wall and alleviating pressure on the low back and the knee joint, this will work wonders for you! It's perfect for students with low back pain. Come into a lunge with a shorter stance than usual, so that the knee of the back leg is directly under your hips. Place interlaced fingers on the lunging quad, and round your upper body into a cat position as your lift the hips upward and depress the knee downward. Send your elbows forward and tuck the chin. Works nicely as a flow between a standard low lunge into this, back and forth, or toward the end of practice for a longer hold.